I just realized this is the 5th review this month. There were quite a few surprises this month – programs which turned into scams even before I managed to wrote a review. Indeed, the HYIP industry is unpredictable. Even though there are certain scenarios played by admins, it’s still almost impossible to say if the program is here to stay on the monitor for one day or a month. Sure, it’s still worth checking additional information about monitored programs. This review is not an exception and I will try to provide a brief insight into a program called WOLF INVEST. WOLF INVEST is another program with a legend about cryptocurrencies. The program has joined Golden Stage on DavidNews.com monitor 10 days ago - on the 17th of February, and currently, it has the status “PAYING”. Overall age of this program is 146 days. We will take a better look at it later and see how it has survived for such long time when the average lifetime of a HYIP program is approx. one month. Sure, it depends on many factors and time of the year. I have reinvested $400 in WOLF INVEST and will keep updated about the payments status on DavidNews.com monitor. Let’s take a quick look at the investment plan details. WOLF INVEST is a program offering 11 investment plans for almost any taste. Moreover, the interest rate in each one of these plans varies depending on the sum of investment. For example, the plan called “140% after 1 day” offers net revenue interest rate from 4-40%. “280% after 4 days”- 20 -180% and “500% after 8 days” – 55% - 400%. Sure, pay attention to the first number because usually, the later interest rate is difficult to reach due to high investment sum. Minimum deposit for all these plans is $10. In fact, the minimum deposit is $10 for the majority of all plans offered by WOLF INVEST. Initial deposit is returned at the end of the investment cycle in all plans except the first plan, which is called “0.8% daily for 200 days”. Keep in mind that plan names for all “after” plans are not actual interest rates and it will be calculated according to deposited amount. For example, the majority of deposits in “140 after 1 day” will be 104% after 1 day, or 4% net revenue after 1 day. Interested? Keep reading to find out more about WOLF INVEST. I talked a bit about the age of WOLF INVEST. I tried to search on Wayback Machine website for archived versions of the website but couldn’t find any screenshots earlier than February of this year. However, after checking several forums I found print screens of a website with classic template built on Gold Coders script. Those familiar with Gold Coders websites know the image on the orange background with the dollars, surfboard, flowers and the palace. However, the main point is that this program has done a redesign since its launch in October 2017. There are no actual pros and cons regarding sleeper projects. It just means that the program has been inactive/less active for some part of 146 days and in February 2018 it has become active again. At least, there are indications to think so. The legend of WOLF INVEST is pretty much a generic story of Bitcoin trading and mining. Is it possible to make enough money to keep the investors satisfied with interest rates offered at WOLF INVEST? Probably. However, we need to remind ourselves that all legends are written to convince that each HYIP is the best and can be trusted. Of course, the reality often is different. Admin has also registered a UK company. Feel free to check out company registration details and address on the website called Companies House. WOLF INVEST is offering flat referral commission, which is 5%. 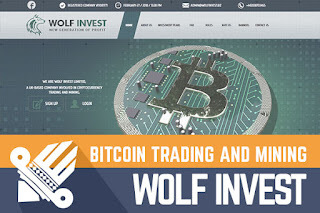 Minimum deposit to join WOLF INVEST is $10 but maximum $100000. The minimum withdrawal amount is not mentioned on the website. The minimal withdrawal amount is important when investing the plan 0.8% daily for 200 days. In the meanwhile, for the rest of the plans with “after”, this shouldn’t be a problem. Drop a message in the chat box in case you have noticed any minimum withdrawal limit. From FAQ page I learned that “withdrawals are performed immediately”. In the real-life situation, the process seems to be manual because they are usually performed within a few hours. Admin has also mentioned that requests can take from few hours up to 24 hours. I already mentioned that there are 11 different investment plans, but I will take a closer look at the first 3 plans - 140% After 1 Day, 280% After 4 Days and 500% After 8 Days. For example, $200 investment in the first would make a daily net profit of $8 (4% daily), second - $10 (5% daily) and third – $13,75 (6.88% daily). Keep in mind that the first plan is for 1 day, second – for 4 days and third – for 8 days. Total net revenue of $200 at the end of each of these plans would be $8, $40 and $110. Of course, the last figure looks like a juicy fruit for 8 days deposit. Still, after the 1-day plan is a safer option. As you can see, we are looking at a professional work on the website with investment plans for almost every taste. The downside of this program is that 91% of all investment plans return the initial deposit at the end of it and it might cause some trouble one day when there will be too many large withdrawals. It’s harder to predict the cash flow if we compare programs with few % daily and the initial deposit is included. The program has been working well since the first day of monitoring. However, it has been down several times for a few minutes. I noticed it and it was also mentioned in our chat by DavidNews.com readers. Today it looks fine but who knows what will happen tomorrow. Keep in mind that all HYIP’s are unpredictable and no program or admin can guarantee the safety of your investment. Therefore, if you ever decide to make any investments, don’t invest more than you can afford to lose! Have you already made an investment in WOLF INVEST and have any useful information to share with us? Please drop a message in the chat box to share your experience! Investment plans: 104-140% after 1 day or 120-280% after 4 days or 155-500% after 8 days. Initial deposit included in the payments.